Our office has been selected by Essilor USA to be a Visioffice practice. 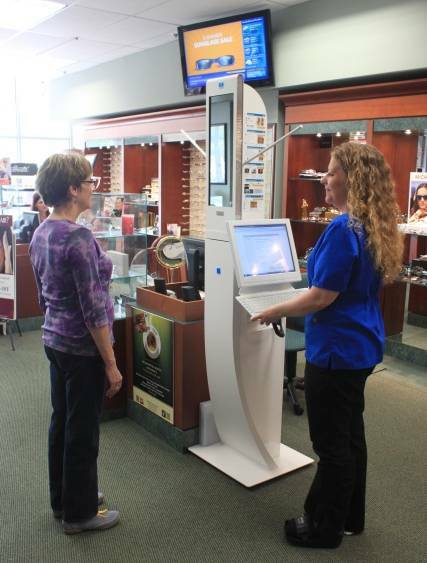 The Visioffice system provides our patients with a unique experience when they are choosing eyeglasses. One of the great benefits of this system is its ability to take specialized measurements for a full range of Varilux personalized lenses. The best spectacle lenses made today are digitally processed using computers. Only the Visioffice can measure the real three dimensional position of each eye’s unique eye rotation center (ERC). Combining this data with our patient’s natural head posture, gaze direction and the position of wear of the frame results in a lens designed perfectly for every point of the lens surface that the eye scans. These precise measurements combined with digital processing make our Varilux Eyecode lenses the most technologically advanced lenses available. In addition to providing us with an amazing measuring tool, the Visioffice is a camera so our patients can see their image wearing their new eyewear before they buy it. This is especially helpful for our patients who are not able to see themselves in the mirror without correction. We can also email you a copy of your photo. The Visioffice serves as an education center, as well. Our patients can watch videos and learn about available lens coatings and features. We welcome you to come in for a demonstration. We would be happy to show you how the Visioffice technology can benefit you.